How can we effectively subordinate teaching to learning in class without using the charts and rods traditionally used in the Silent Way? ★We are going to explore a wide variety of ideas and activities. ★We’d like to offer some of the participants a special discount on the course fee if they are willing to share any demonstrations of activities they may be doing in their classes. In addition, a special discount is available to those participating in the English the Silent Way workshop. ＊＊＊Time can also be set aside for teachers who would like to work with the class in the Silent Way, with or without traditional Silent Way teaching materials. Donald Cherry has a Master of Arts in Teaching (MAT)　from the School for International Training . 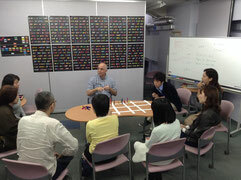 He has been teaching English using the Silent Way for more than 20 years. He currently teaches English at Hiroshima International University. Please refrain from calling KAI Japanese Language School. Applications will not be accepted after the maximum number of participants (15) has registered. Please fill out the on-line form or apply by email to our address mentioned below. !!! Please remit the fee after you receive the confirmation from us. !!! We will issue a receipt on request. ★★★We’d appreciate it very much if you could kindly circulate this information to whomever you think would be interested in the workshop.